The Aberdeen Highland Games isn’t just about the competitive sports and displays, there are also plenty of novelty events which are great fun for everyone. The young and old can take part in some fairground classics such as the three legged race and everyone is encouraged to dress up in their best Scottish attire with prizes awarded to the best dressed laddie, lassie, bairn and pet. No prior entry is required; just turn up on the day ready to have a great time. 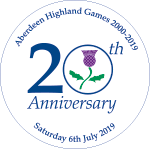 The local community is also encouraged to get into the spirit of the Aberdeen Highland Games with competitions for the best shop window display and a colouring-in competition run in the local primary schools.